As a private wealth client, your wealth depends on various factors. We manage and anticipate changes in complex markets every day, plan for every possibility and execute accordingly. We also have a flexible plan for responding to economic, financial and political changes. The challenges have never been greater. Portfolio & Risk Analytics for private wealth clients empowers institutional-grade implementation of your portfolio investment and risk management strategies. The outcome is making quicker, more informed decisions and measuring market-related and security-specific risk exposures for our private wealth clients' portfolios. At Coastlight Capital, we are committed to continuously adding greater clarity to investment decision making and ensuring that our clients feel completely confident in these critical decisions. Portfolio & Risk Analytics gives the ability to analyze the historical performance of your equity, fixed income or multi-asset portfolio on an absolute basis or relative to a benchmark. It identifies the sources of your portfolio’s absolute or excess return by asset class, sector, geographic region, a custom classification, and even based on a multi-factor risk model. Monitoring the intraday performance of your equity, fixed income or multi-asset portfolio in real-time as well as quickly accessing the news which is most impacting your portfolio today. Immediately identifying today’s top and bottom return contributors. Portfolio & Risk Analytics centralizes the critical data and analytics needed to understand the structure of your portfolio. Displaying the fundamental metrics you care about most, such as P/E and dividend yield for equity portfolios or effective duration for fixed-income portfolios. Creating custom growth or trend metric leveraging a vast fundamentals database. Coastlight Capital uses fundamental risk factor models to measure and analyze your portfolio's risk through multiple lenses, including tracking error, stress testing, and Value-at-Risk. 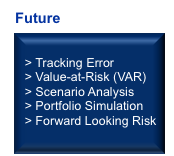 Portfolio & Risk Analytics for private wealth clients includes fully integrated portfolio construction tools. Trade Simulation and Portfolio Optimization allow us to easily and rapidly identify trades that will ensure we make the best investment decisions.